Table Mountain is one of the most recurrent literary, cultural and artistic icons in South African history, signifying changing relations and attitudes towards the Cape (and Africa) over the past five centuries, quite apart from its obvious prominence as a natural and geographical landscape. Whereas it once symbolised all that was strange and enigmatic to the outsider looking in at the Cape of Good Hope, today it ‘speaks’ through the various local inhabitants in different ways with astonishing clarity, variety and diversity. During his World Environment Day address in 1998, the then State President Nelson Mandela went further and made an analogy between Table Mountain and the nation of South Africa as if their fate was intertwined. South Africa had, he said, embarked on a long, arduous climb, which he likened to an ascent of that mountain, where the determination to succeed was coupled with a collective sense of unity and optimism. Table Mountain as a symbol of unity may be an inspirational ideal; nevertheless, for the moment it remains a symbol of the deep divisions between the haves and have-nots that persists in post-Apartheid Cape Town. One of the major debates facing the city today and in the foreseeable future is about why the city remains segregated, alienating for black people and fundamentally divided. The question is how to make Cape Town an integrated and thriving metropolis that offers hope and opportunity for all who live here and travel through it? This long overdue debate is a necessary, even if painful, process if we are to figure our way out of the mire of the apartheid city. However, the challenge facing Cape Town is not merely the fact that the working classes and poor live on the periphery of the city. The more immediate, fundamental challenge is the lack of any real social engagement across the class and cultural divides of the city. Middle class Capetonians and business people, who never go into the townships and informal areas of the Cape Flats need to have first-hand experience of those areas in order to develop some sort of common identity with their fellow inhabitants. The Provincial government in the Western Cape has declared its intention to “take up arms against the three and a half centuries of political and social oppression and racism that has characterized our past”, which it has called “ Shared Growth in a Home For All”: that is, to transforming the divisive social and economic patterns of our past and to create a sustainable vision of a better and a shared life for all in the Western Cape. Large-scale intervention is required to make human settlements in the urban core of Cape Town a reality for the poor in the immediate and foreseeable future. But before the physical construction of the new city can be undertaken a process of systematic and extensive dialogue, consultation and social engagement will be needed to guide the process in a sustained and confidence building way: informed urban renewal. Art and culture can make a significant contribution to this understanding. 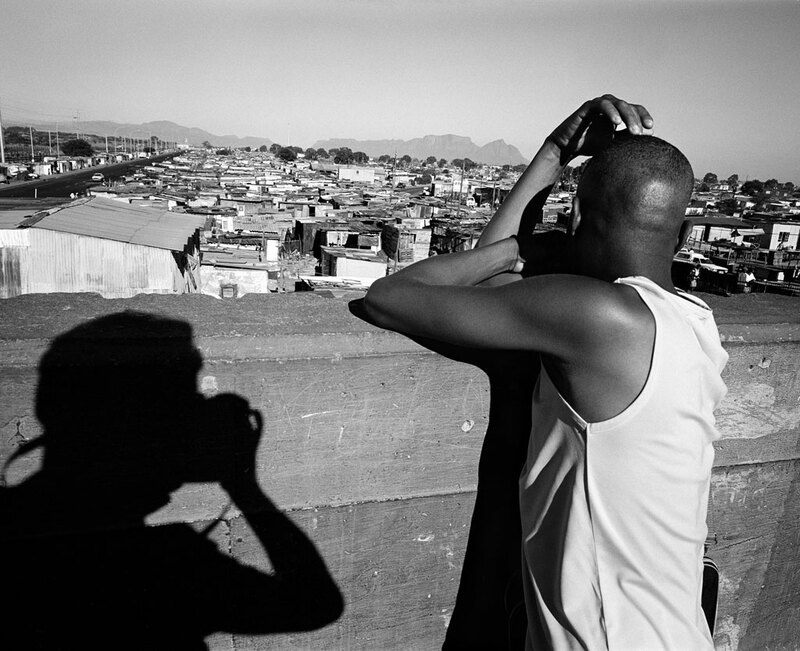 What I have tried to do in this project is to view the mountain from the perspective of different parts of Cape Town and the different communities in order to explore the socio-economic divisions that remain following the end of apartheid, and that persist despite 10 years of democracy. People who have seen the images – even well informed Capetonians – have been surprised if not shocked by these views of the city that they were oblivious of. It is recognized that we will first need to create a social dialogue that enjoins us to take responsibility for reaching common and agreed goals – all in our unique spheres of influence. As a photographer, I hope to make a contribution to this process.